Thanks for the chance! I’d love to win shi I can expand my knowledge of paint since i’m just starting to love it… …it’s also a chance to show that women of color love art too!! I would like to win a place in the Life book 2019 because I already adore everything that is proposed in the Summit, it enriches me and nourishes my creativity. It would be wonderful to live all this for a whole year! I would love a spot because I love the feeling of creating. It is calming. 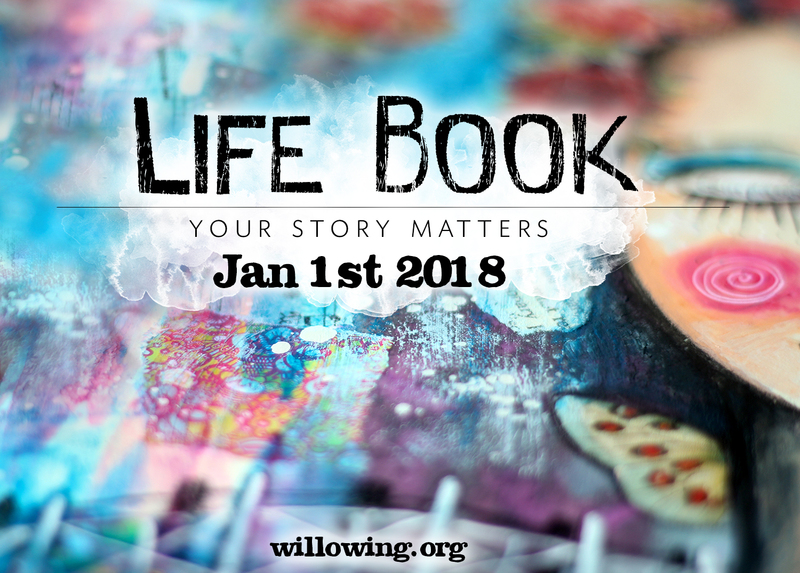 I did Lifebook for the first time last year and I loved every minute of it. I hadn’t drawn since high school and I’ve learned SO much. Thank you for the opportunity to win. I would love the opportunity continue learning new techniques and am excited about the possibility of winning a spot! Thanks for sharing this with us! Good luck, everyone and keep creating! I really believe that creativity can make life beaytiful and life book is full of it!! I would love to win a space for Life Book 2019, I honestly just can’t afford to do anything for myself right now with where I am in my life. I would love to win a spot in Lifebook 2019. It would be a fabulous life changing opportunity. I could use the money that’s saved to buy the lovely art supplies that I don’t have. I would really like a spot on Life Book 2019 as the summit has been so magical, it would be amazing to continue this throughout a whole year. Many thanks for the opportunity. Hi Lucy, I really enjoyed watching you make your galaxy affirmation cards on the summit. I am new to art and it can be overwhelming, but I reckon that if I won a place on Lifebook 2019, I would soon gain lots of knowledge and confidence. Thank you Lucy. I have LOVED what I have watched so far on Tamara’s Summit, the interviews and activities are just what I need in my life right now. I want MORE of it, by doing Life Book 2019. Thank you for the opportunity to win a free place in this course. I would love to win a spot. Drawing and being creative helps me through hard and dark times. It helps ,e to stay focused, calmed and relaxed. I want to push myself further in art. Winning a Life Book spot would certainly help me attain that goal. Thank you for your wonderful galaxy affirmation cards tutorial. Looking forward to trying masking fluid on something. I would love to win a spot in Life Book 2019. I am new to mixed media and would love to learn new techniques from amazing artists. Thank you so much for this chance. I was fortunate to be in LB 2018 and it took me a few months to become confident enough to stretch my comfort zone, spread my wings and try many of the new techniques I was being amazed by. Then I splurged on new craft supplies. I would love to win a place in LB 2019 to continue to grow and to keep me motivated and finding out what I can do with my new crafty supplies! Thank you for the chance to win a spot in LB2019. I would love to win and participate. I have signed up for your newsletter and shared on FB. I would love an opportunity to continue my creativity through LifeBook 2019. I’ve had a difficult year: lost my sweet dog, a dear loved one, two cancer scares and 4 mo of illness followed by recovering from damage to my home during Hurricane Florence then hurricane Michael and then the loss of a long standing marriage. It seems every time I got up Something knocked me down again. But what kept me getting back up was my determination to renew my connection to my creativity. I think LB2019 would help keep me on track to cultivating my art and keeping my connection alive. Thank you for the chance at it. Hi Lucy, loving the summit so much! Never done lifebook before…would love to win a spot. I would love to win a spot on LB 2019. I have not been able to take the course the last few years and I miss it tremendously. I have participated in the Summit and am excited to learn from all the wonderful artist teaching this year. I loved your lesson and would like to learn more from you. Hi Lucy. I am loving the Summit and would love a chance to learn so much more from all you wonderful teachers. Hi Lucy. I am loving the Summit and would love the opportunity to learn more from all you wonderful teachers! Hi, thanks so much for the opportunity to win a place in life book 2019. After hitting rock bottom in 2016 with the lose of my job followed 3 days later by my marriage of 25 years ending, I feel I am finally turning the corner, watching and doing art has really helped me. Unfortunately my very tight budget won’t allow me to take part this time. Good luck everyone. Thank you for organizing this give away Lucy! Love your work! I would love to win a spot in LifeBook 2019, also because I would love to learn more from you and participate in your classes. Shared on my Facebook. I would love to win a spot for Life Book 2019 so that I can grow my art skills and branch into mixed media. The summit has been amazing and I am hooked! I think this will help me to take time for myself (I work full-time outside the home and a mother to some amazing older children, grandchildren and kids that call me mom), and learn how to become a better person as I care for my family and patients. I have started learning more art, after doing papercrafting to help me deal with chronic pain and a disabling neurological disease. I have a long way to go to become an “artist” and a lot of learning to do. LB2019 sounds like something that could really help me. Thanks!